The Email-In feature lets you post messages, to-do lists, files, and text documents to Basecamp 2, just by sending an email! Watch 📹 this awesome little video to see how it works! Click that link: You’ll see a sheet pop up, with five icons at the top of the page. Each icon describes a different Email-In feature: Starting discussions, making to-do lists, creating documents, uploading files, and forwarding emails. Click any one of those icons: You'll get directions for using each feature. You'll find an example of an email and how that content will look when it’s posted to Basecamp. Make sure you're sending your email in plain text, not HTML? Here's how to check. 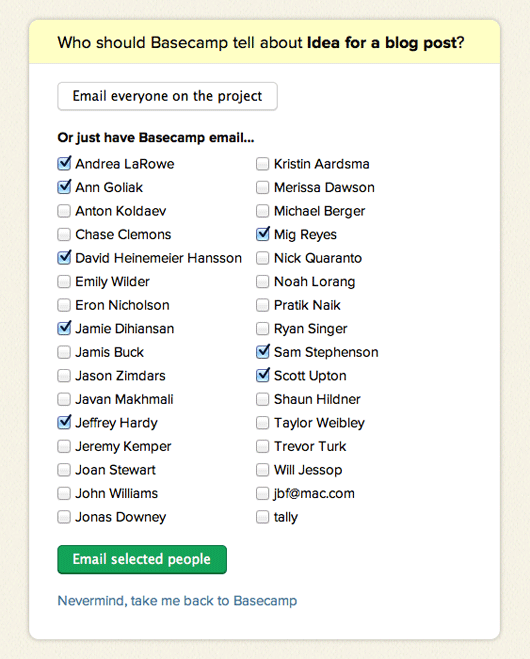 Basecamp receives your email and posts your content to the project. You'll get an email that lets you know it worked. For messages and files, you'll see the option to notify other project members, all through email. There's a mobile optimized version of the notifications screen too. Use Email-In on the go! 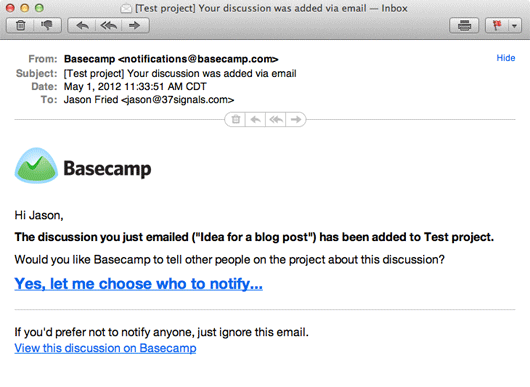 Forward your emails to Basecamp 2: Collect your email discussions in a Basecamp project by forwarding them. Don't use your Email-In address in the CC field – it exposes your address to everyone receiving the email. Use the BCC field instead! Any items you email-in to a client project will be visible to the client. 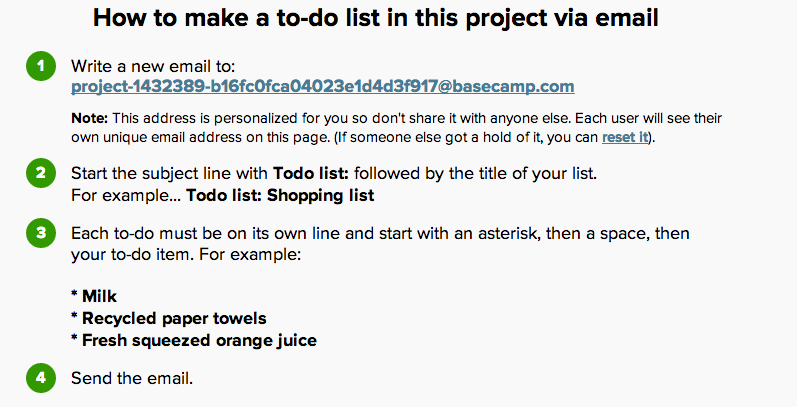 If you want to make them private, you'll need to edit the item within Basecamp. Forwarded emails cannot be made private. Now that you know how Email-In works, get the most out of it! Templates: Basecamp 2 offers templates for an entire project, but not project items. Use Email-In to recreate individual to-do lists, text documents and other project items. Just save a draft of that email and send it to your new project. Add content on the go: Email-In is a great way to add lists, messages and files from your mobile device. Snap a picture on your phone and send it right to Basecamp! Project drift: It happens to all of us – projects can start strong in Basecamp, then drift off course to using email. Forward those conversations to Basecamp to get everyone back on track. Moving data to a new account: Use the Export feature to help. To-do lists will be broken out into individual files. Copy those, and paste them into an email. Add the list title to the subject field, edit the formatting, and send it to your project. DIY API: You can have your apps send emails direct into Basecamp whenever you make a sale, get survey results from a customer, and so on. They can be forwarded emails or brand new discussions.